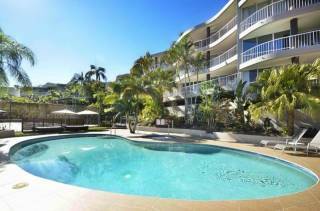 Ground floor north facing unit in a lovely garden setting with partial ocean views. Modern fully self contained unit with reverse cycle air conditioning. Main Bedroom has king size bed and second bedroom has two set of bunks. Sleeps 2 adults and up to 4 children. Suitable for a couple or a family. Maximum 2 adults (over 15 years). 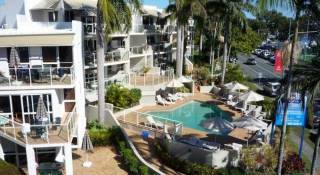 Located at the southern end of Sunshine Beach and surrounded by lush landscaped lawns and gardens, Sunseeker offers you the most spectacular ocean views of any Sunshine Beach accommodation. 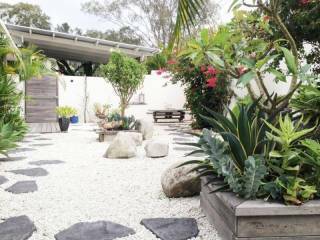 We are located on a quiet street, away from the hustle and bustle of every day life. Facilities include a heated swimming pool and spa,BBQ, games room and undercover parking. 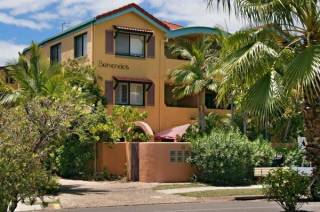 Direct access to the beautiful long sandy patrolled beach is via a pleasant walkway located in front of the Resort. Sunseeker is a resort comprising 24 spacious 2 bedroom fully equipped holiday apartments. The apartments contain fully appointed kitchens, and include microwaves and dishwashers, washing machines and dryers. Free WIFI and Austar is available for guests. Free WIFI throughout complex . Undercover Car Parking is available for one car per unit. Take a stroll along the beachfront, a dip in the ocean, ride the bike trails or take advantage many of the many water activities on offer. Take a ride on the Ferry or hire a boat for a spot of fishing. Take a walk in the beautiful national park or go for a bite to eat at one of the numerous cafes and restaurants. 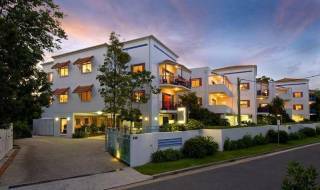 On the other side of Noosa Hill, only five minutes drive away you will find Noosa's famous Hastings Street offering boutique shopping as well as a fabulous array of restaurants. A leisurely drive to the Hinterland. Australia Zoo or Eumundi markets will be an enjoyable day. Explore Fraser Island or the Everglades for some beautiful Australian Flora and Fauna. This is a booking request only and final confirmation will be made by the hotel when the deposit is taken. Pease refer to office opening hours and contact reception if arriving after 5pm on weekdays and for all weekend check ins to arrange key collection. Check out is strictly 10AM. Late check out fees will apply. Rooms left in an untidy manner will be charged an extra cleaning fee The authorised credit card supplied will be charged to pay for extra costs or breakages incurred as assessed by the management. The conditions of booking & occupancy at Sunseeker Holiday Resort are as per PAMDA Act. 2000 as printed on your receipt, the Body Corporate By-Laws & the information supplied in the Sunseeker Compendium. By signing this I agree to the conditions of booking and will be bound by these and the rules of the management. From Brisbane, follow the Bruce Highway north till the Noosa Heads/Eumundi exit. Follow the signs towards Noosa Heads. Turn right in to Eenie Creek Rd. Follow this road until the Sunshine Beach/Hill St Roundabout. Go straight through roundabout and take the first turn right in to Ross Crescent. PLEASE TELEPHONE RECEPTION 24hrs PRIOR TO ARRIVAL IF ARRIVING OUT OF OFFICE HOURS TO ORGANISE ACCESS TO UNIT. Our number will be on your booking confirmation.